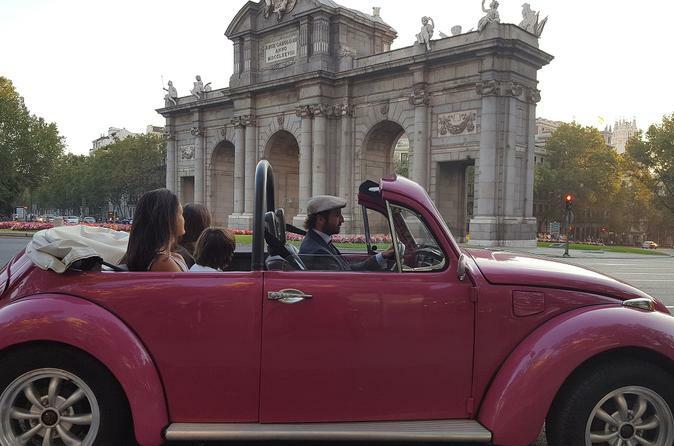 Imagine the feeling of air entered into a mythical vintage convertible car while discovering Madrid, its gastronomic, its streets and most representative monuments guided by a friendly driver who will tell you histories and anecdotes of Madrid. Hop on a mythical Convertible Beetle and spend a half day discovering Madrid while typical Spanish food taste a selection of the best taverns and bars in Madrid. You will be picked up at your hotel and will take you to unique tour by Madrid full of style. Just relax and enjoy the breeze while experiencing the Spanish Culture. Enjoy on this 4-hour tour visiting Madrid by beetle and tasting delicious tapas on the way. You will be picked up at your hotel or another suggested place and your tour will start at Debod Temple, stop in Plaza de Oriente, see the Royal Palace and Almudena Cathedral and taste the first "tapa" in a traditional tavern. Go to the main square, plaza Mayor and the neighborhood of La Latina waking where you will taste the second "tapa" in another renown tavern. Hop on in vintage convertible Beetle and visit the Plaza de Cibeles, Puerta de Alcalá and Santiago Bernabeu stadium where you will taste the third "tapa" while watching the grass of the stadium. After the last tasting you will hop on again to go towards the northern area of the city where you will find the new central business district with its impressive skyscrapers, the highest buildings today in the country, some of them built by very recognize architects such as Norman Foster. From here, the car will be slowly going back to the ending location having the last bit of this panoramic tour.